This post is a bit late. Excuses — 1) this past weekend we were busy with a pretty epic hike (that post to come) & 2) There were just WAY too many photos to go through–between my photos and our guests there were thousands to check out. If you want to check out my Flickr album from this past week, go here. Numbers indicate what location we were in on what days the guys were here. Days 1-5 were covered in the previous FiNZ 45 post. Days 6-10 were covered on our 4.5 “long” weekend…which felt more like several weeks…you’ll get the jist as you read on. 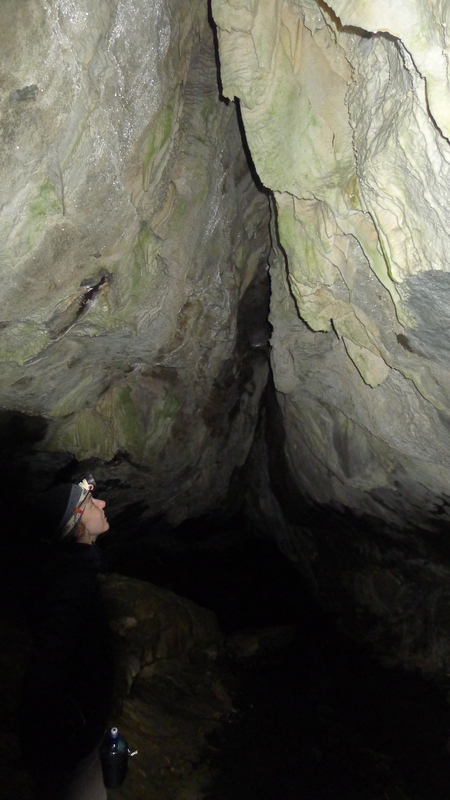 Our first stop, which was probably poor planning since the car smelled like damp clothing for the rest of the week, was Cave Stream. 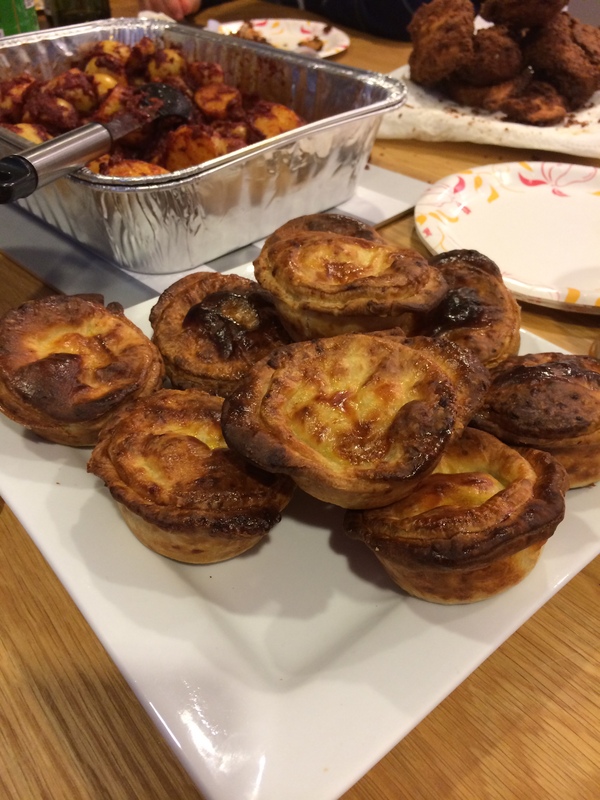 Keith and I had done this previously and knew it would be fun to go back with first-timers. 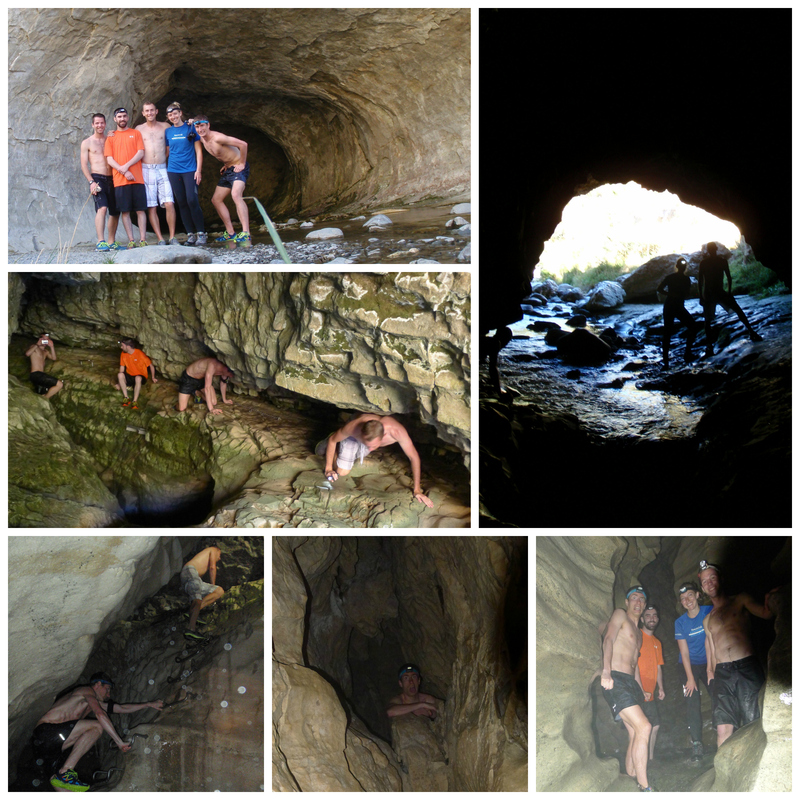 Luckily, it was a warm and sunny day, and the cave was a great way to cool off or “shower” after the earlier run. We spent the night in Greymouth, had a less than exciting dinner at the local dive, but enjoyed a quick west coast ocean walk. 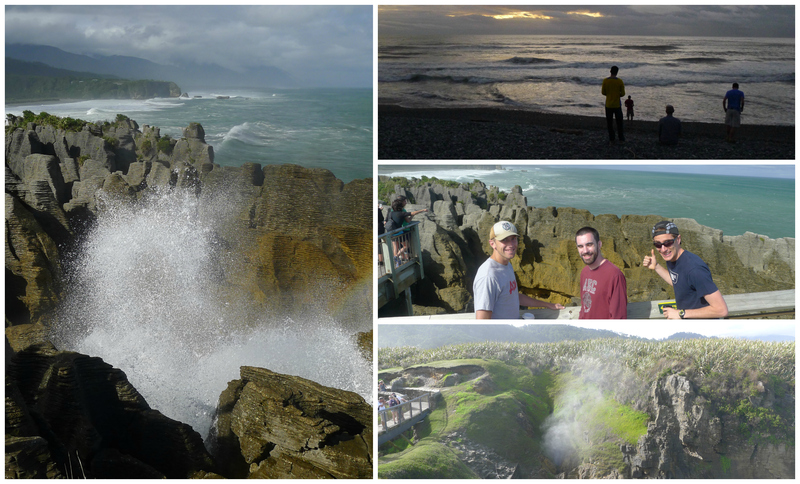 In the morning we diverted up to Punakaiki to show off the pancake rocks. The timing worked out perfectly as it was 30 minutes pre-high tide. This made SUCH a difference from our first experience. Sure, the rocks look cool, but the waves crashing up through them – incredible! 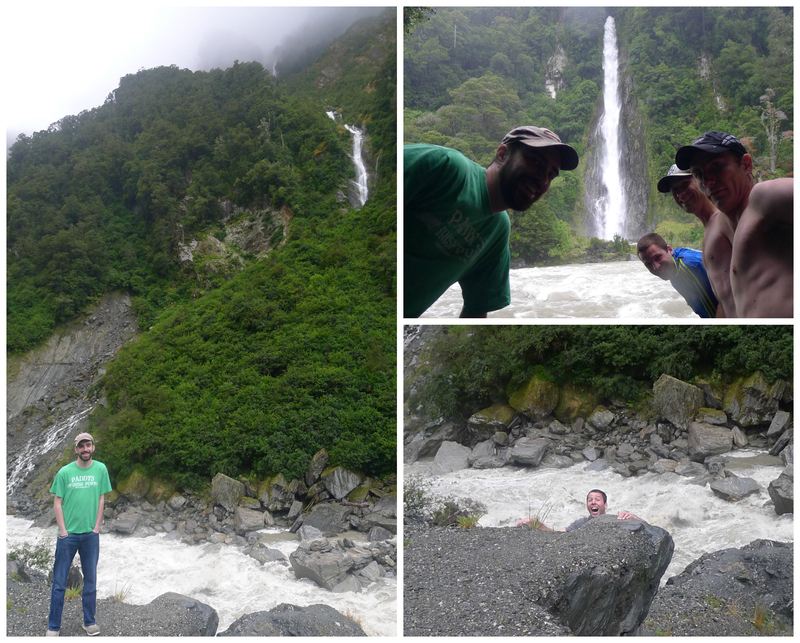 Then we were off to glacier land, but not without a lunch break at Hokitika and a side trip to Hokitka Gorge. 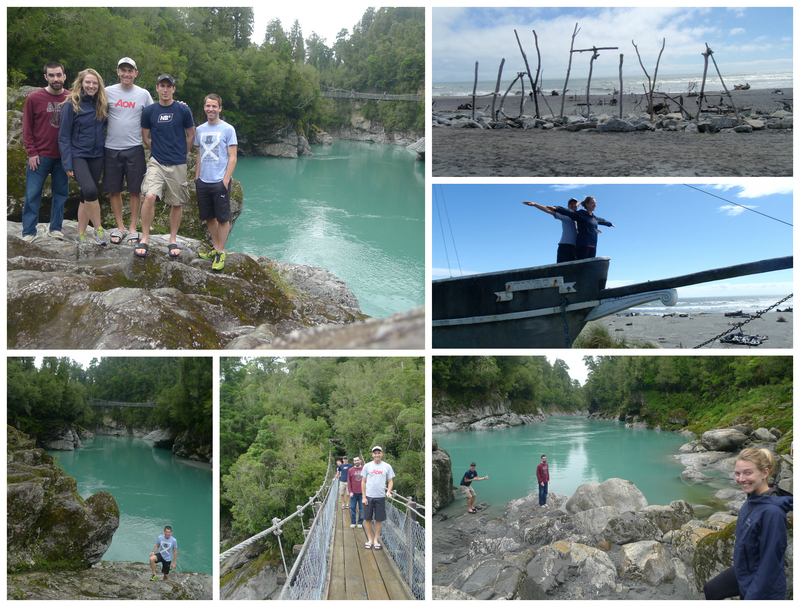 We had some much better food in Hokitika (versus Greymouth), walked the beach with all its “stick-art”, found a great opportunity for a Titanic pose, and headed out to the beautiful gorge with its bright blue glacier water. 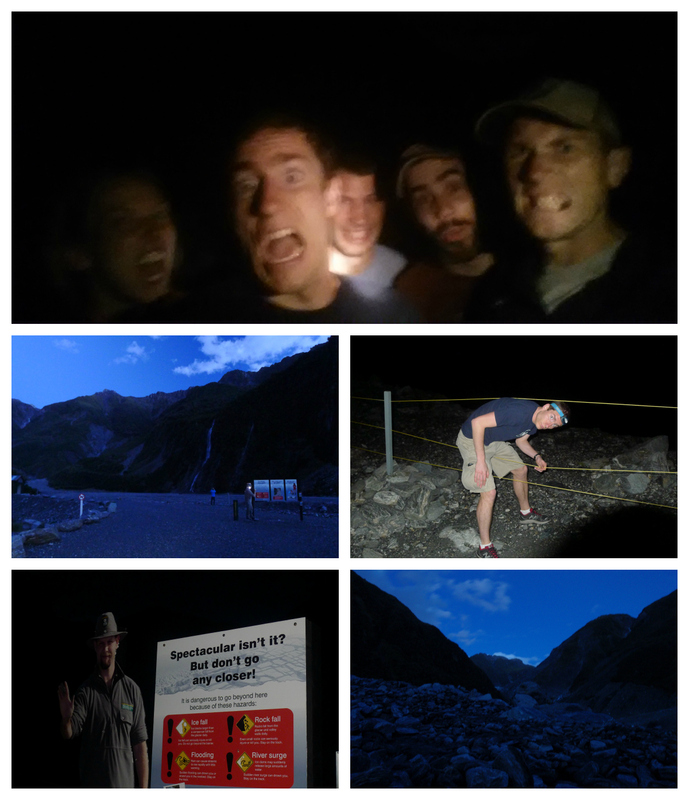 Keith and I were excited to drive through Haast Pass for the first time, but it was pouring rain…as expected. So the drive was okay, and at least the rain made the waterfalls truly spectacular. 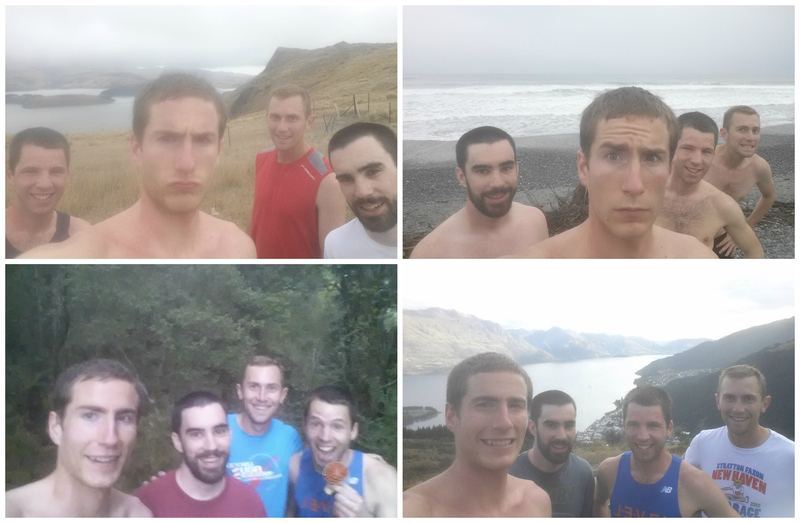 We made a few pit stops along the way running through pouring rain (the guys in bathing suits/shirtless) to get some token shots. As usual in New Zealand, we got through the pass and the weather changed dramatically. The blue skies shown and the sun came out. 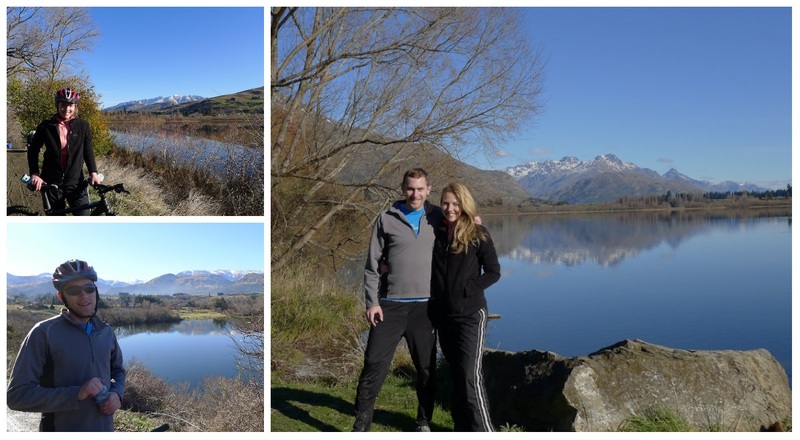 We took several more pit stops on our way to Wanaka wear we stopped for a great lake-side lunch, and then on our way to Te Anau. We hopped on our giant Jucy cruise (with a mere 10 other people; definitely recommend the earlier cruises – less tourists!!) and watched as the clouds broke up and the sun came out over the fiord. I don’t think we could have gotten more perfect weather. The downpour created thousands of waterfalls throughout the fiord, and the sun revealed all its other beauty. 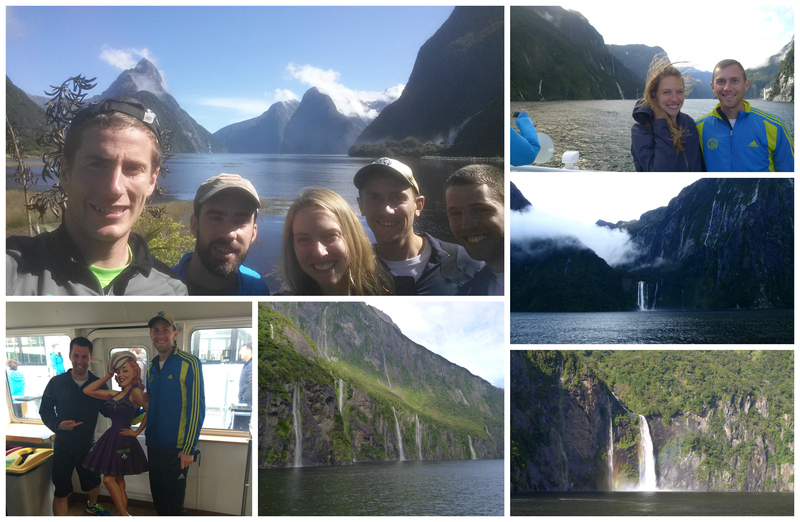 It was a truly perfect day in Milford Sound. 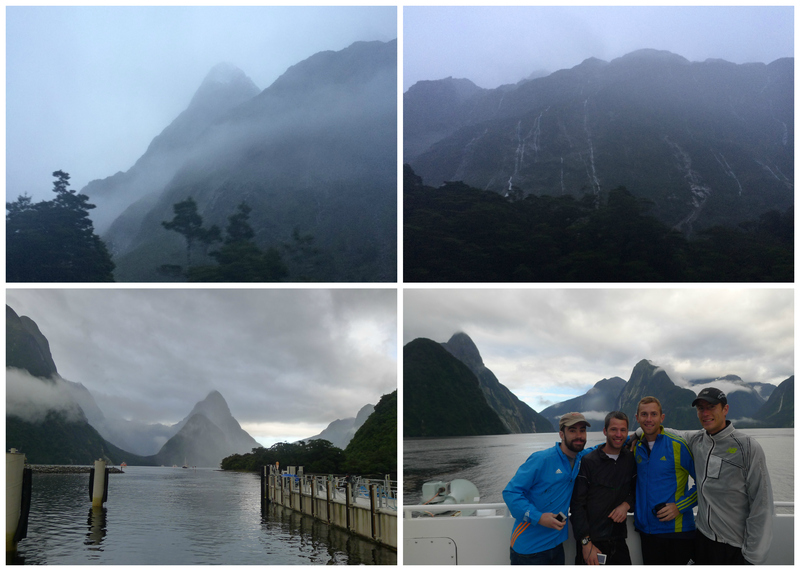 Milford Sound becomes sunny and even more epic.. The road back we got to experience with blue skies and sun! 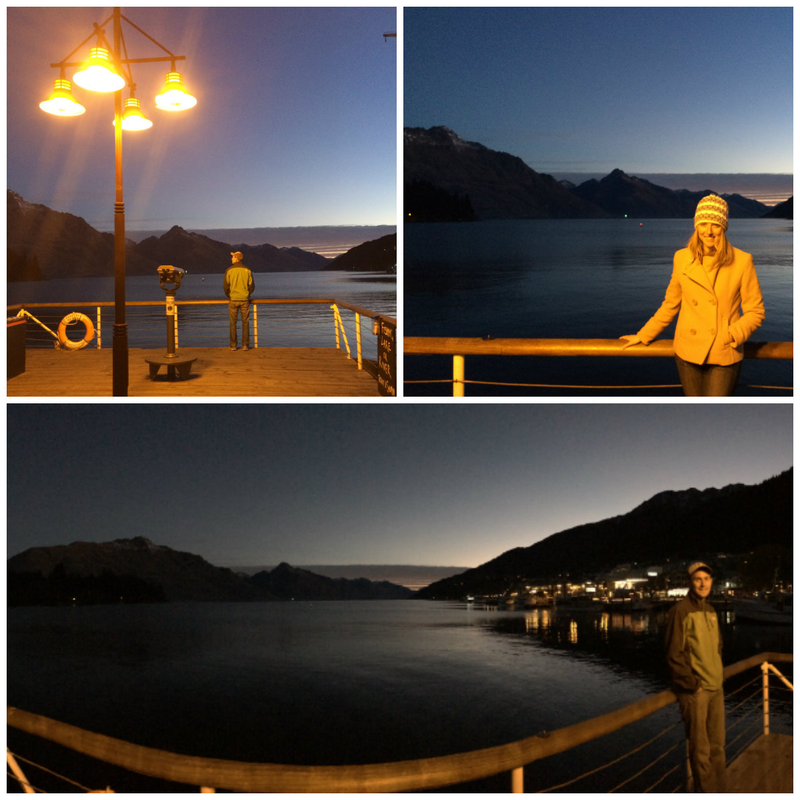 We had a lovely warm drive back through the Milford Sound road and up to Queenstown where we spent our last night of the journey soaking up resort-filled Queenstown with good food, dancing, and souvenir shopping. Overall we had an amazing time with Chris, Josh, and Pete. 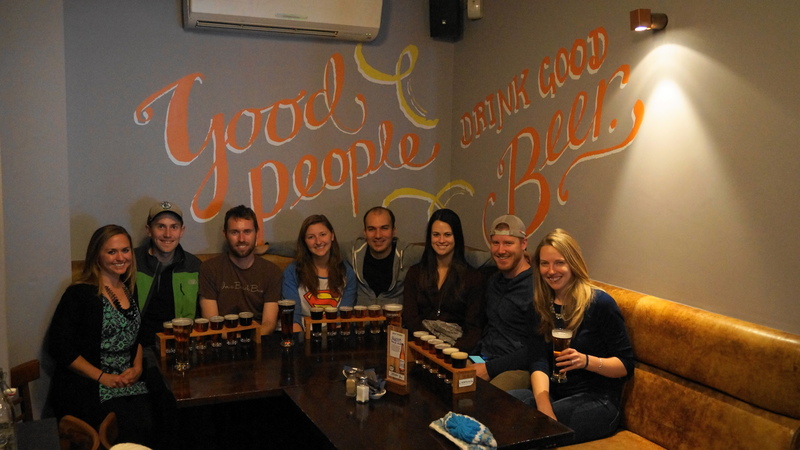 Thanks guys for visiting, we hope you had fun too! I’ve been avoiding sorting through photos from this past weekend because there’s just so many. Alas, I managed to pick out a “select” few and collage the crap out of all of them so they’d fit somewhat nicely here. 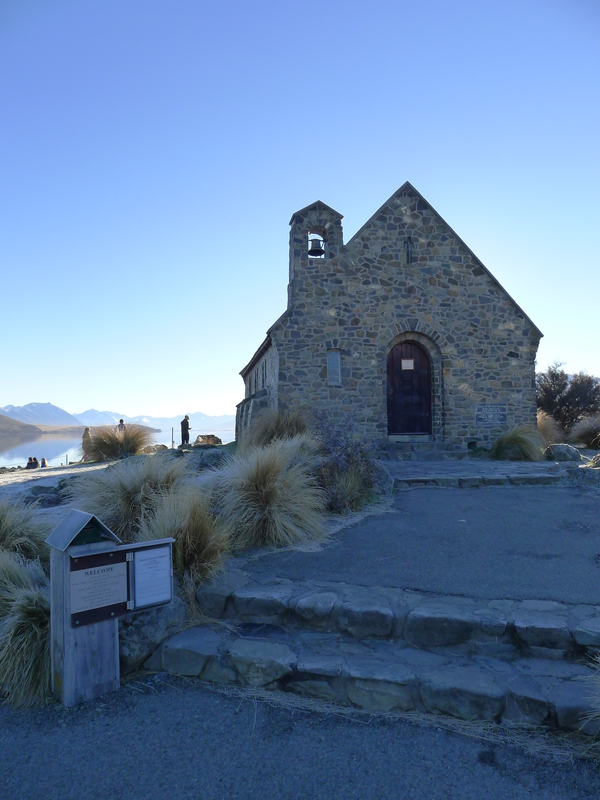 Friday was a precious New Zealand holiday – Waitangi Day, aka “the 4th of July New Zealand style.” Luckily, that gave us a head start to drive down to Queenstown and meet up with Kathy and Don Friday morning. Friday ended up being one of the most intense activity days we’ve had here. To back up a bit, a freak cold snap had come across the country and Queenstown temps dipped to near 0 Celsius the previous two days. That meant that 1) the surrounding mountains were covered in snow in the middle of summer and 2) I was really glad I checked the weather and brought my fleece and winter hat. Fortunately for us, Friday started to thaw the town up. 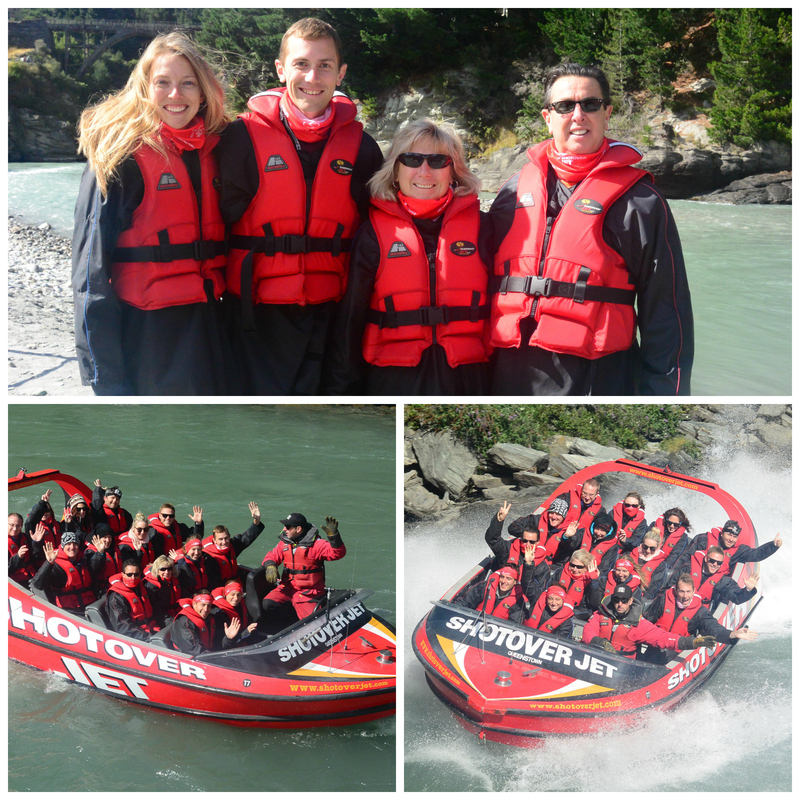 Our first stop was the Shotover Jet–an activity Keith and I’ve been waiting until warmer weather (the joke’s on us) to do. 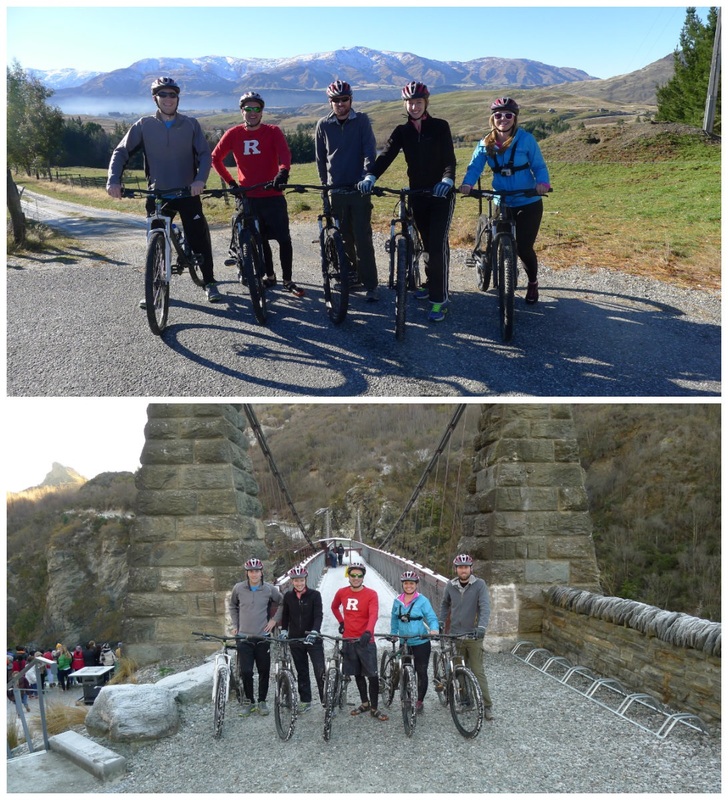 I’ve heard its one of the “must-do” activities in Queenstown PLUS Prince William and Princess Kate participated when they were in New Zealand last April! 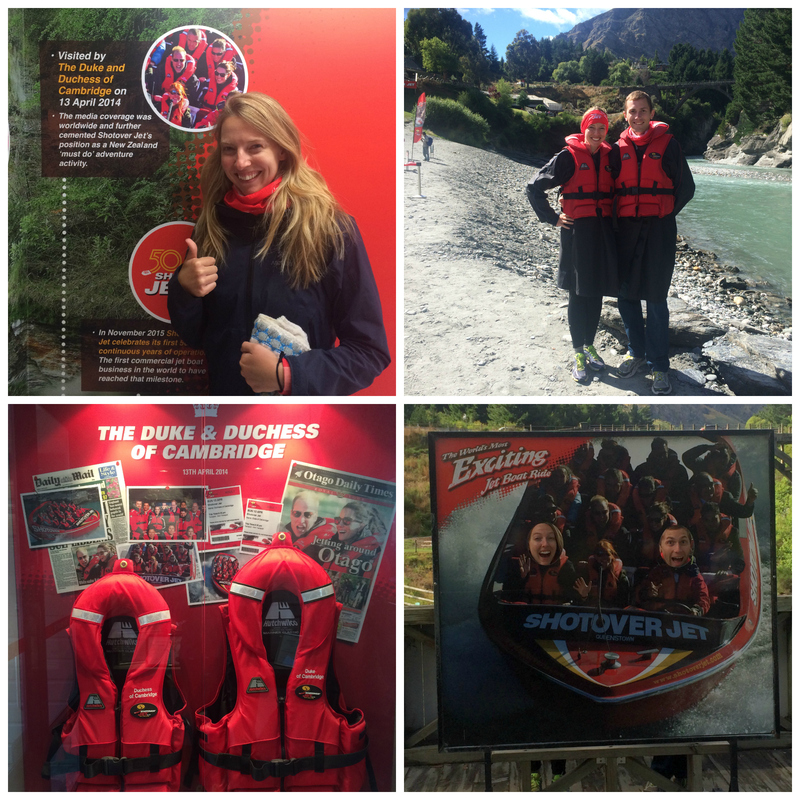 I may have required the exact seat Kate sat in… Albeit a pricey activity at $130/person, if you’re going to do SOMETHING adventurous in Queenstown, pick the Shotover! 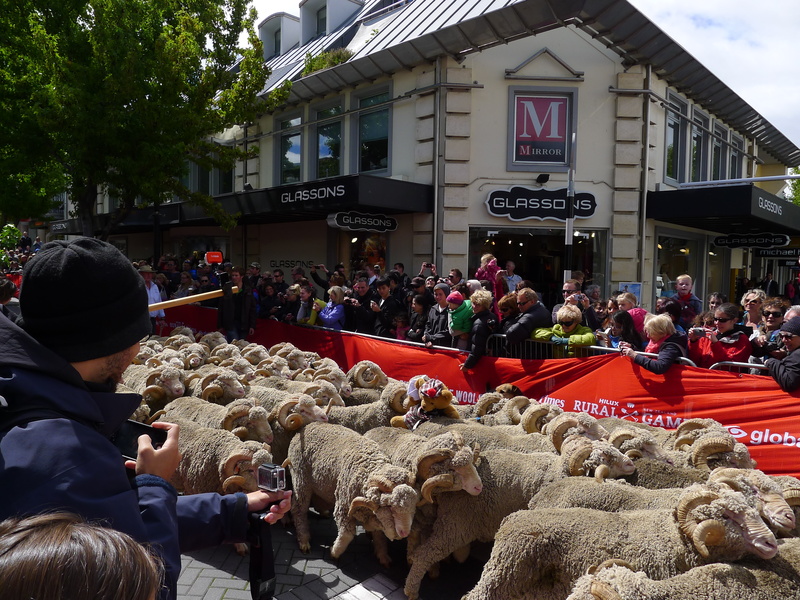 THE RUNNING OF THE WOOLS! 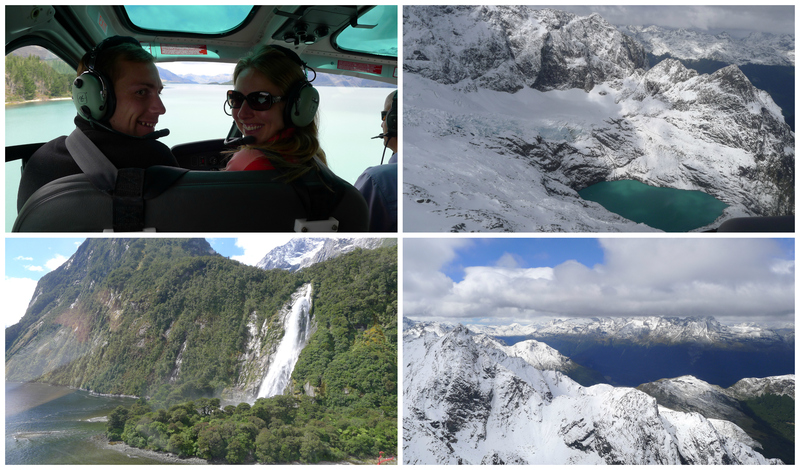 Soon after we were picked up and whisked away to the airport to do a Fiordland helicopter tour with Glacier Southern Lakes helicopters! 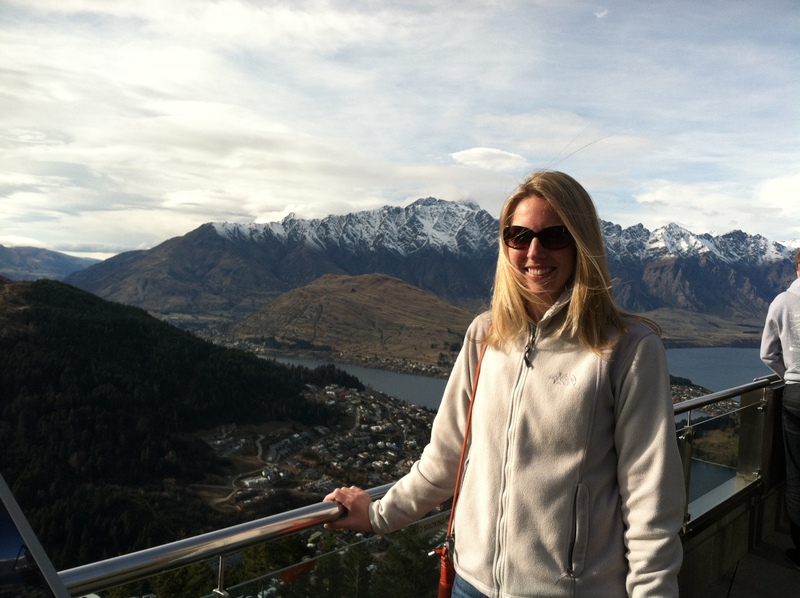 Kathy had really wanted to do a helicopter tour but the weather had cancelled every trip until we arrived. 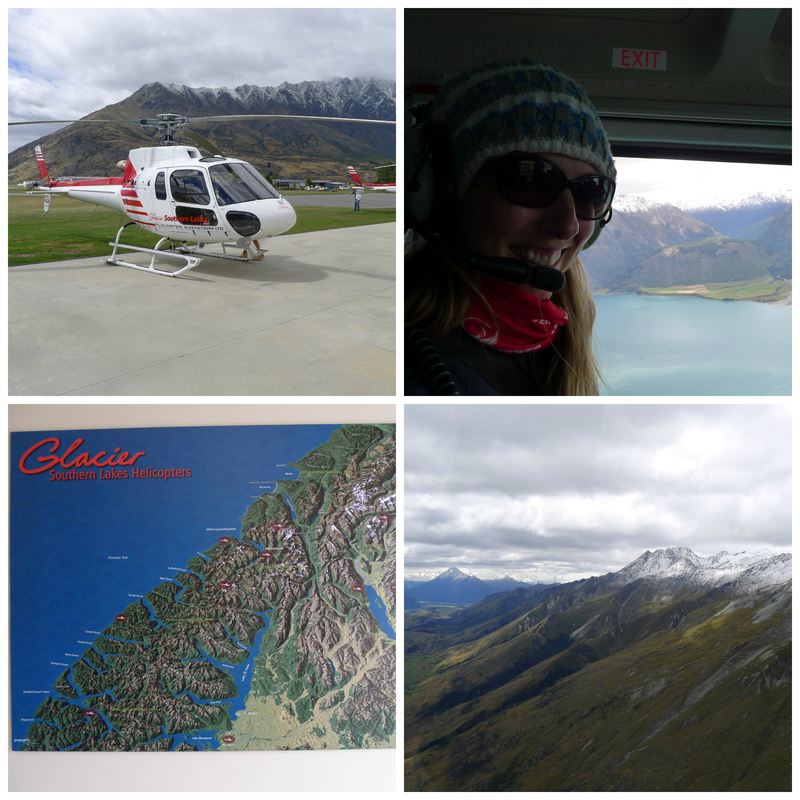 We were more then happy to join and what an incredible experience–we landed at 3 planned locations and had to pick up a couple at the beginning in Glenorchy (because why get driven to the airport when the helicopter can pick you up outside?). It was the first time I’ve been in a helicopter and it was quite the first time! 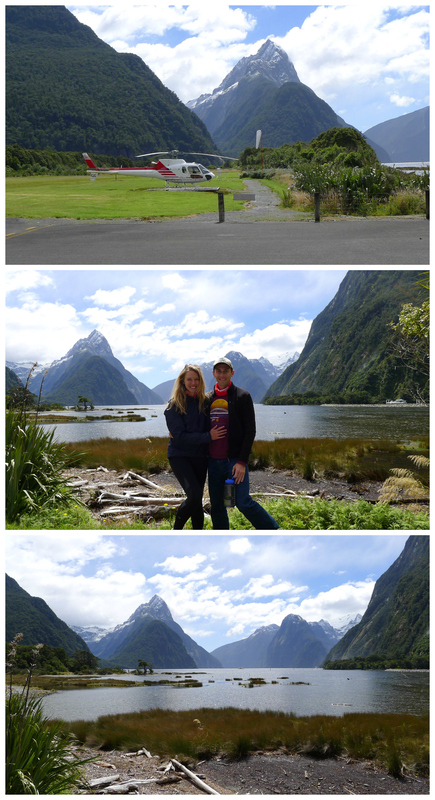 You can’t come to New Zealand and NOT see Milford Sound. Despite the flocks of people, it’s simply necessary. This was Keith’s first time out here — I’m glad we finally both made it! 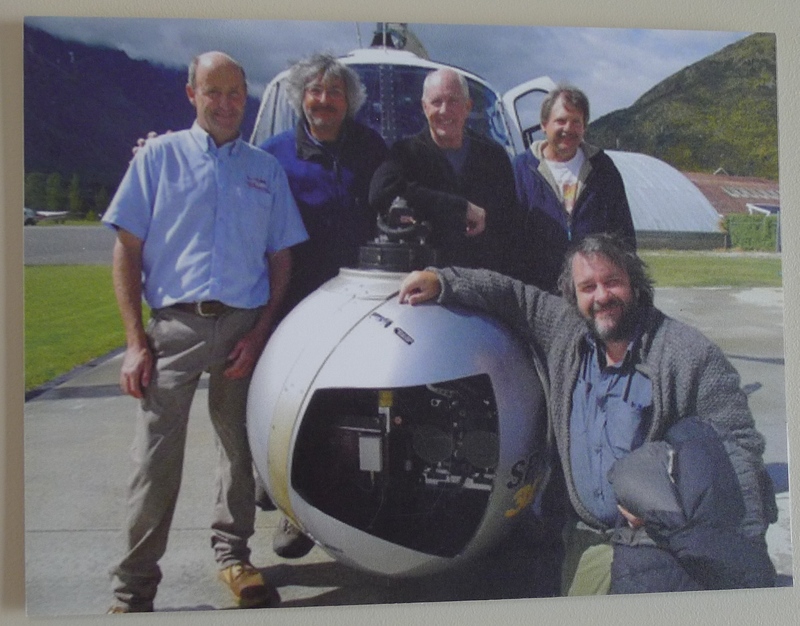 It’s noteworthy that our trusty pilot, Alfie, was the lead pilot in all the Lord of the Rings and Hobbit filming! I snuck a photo of him (far left) with Sir Peter Jackson. They’re surrounding the special camera they used while in flight. What a day. 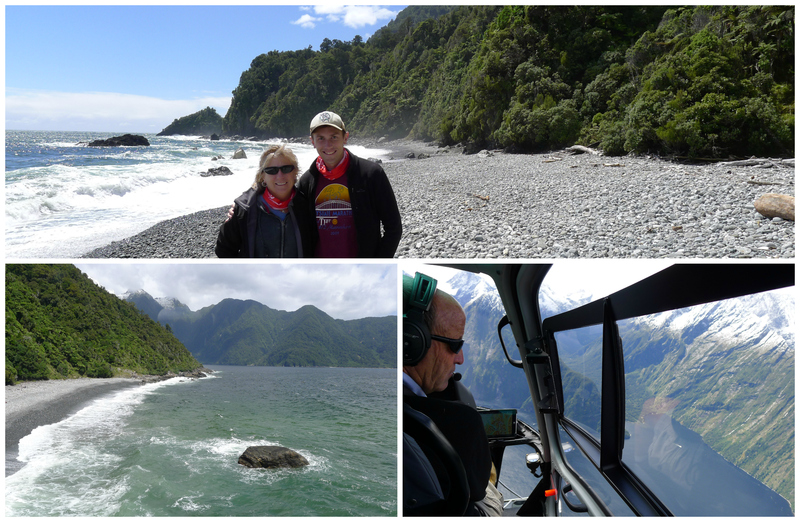 Possibly the most exciting day I’ve had in New Zealand. We enjoyed a well earned beer, had a great dinner at Cow, and bar hopped a bit the rest of the night. 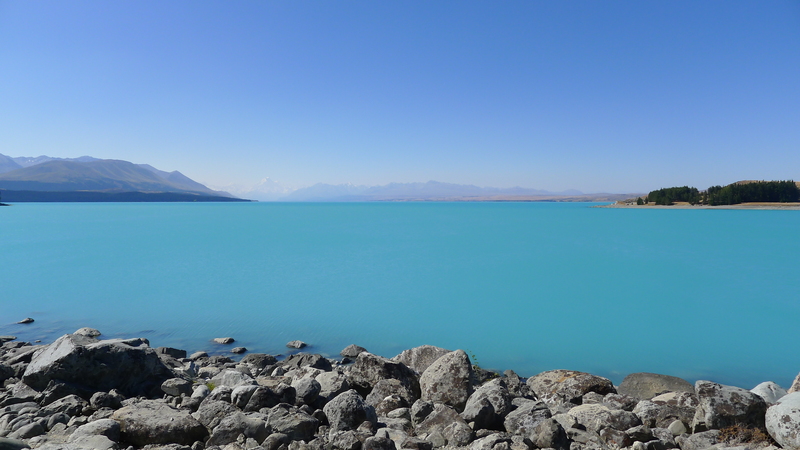 And of course we ended our journey with yet another beautiful blue lake Pukaki, the water color is always so fantastic. Below you can barely see Mt Cook in the background through the haze. On to our next adventure! Keith and I finished our last work day of 2014 on 19 December and spent the night packing for our first half of our 2 week New Zealand adventure. 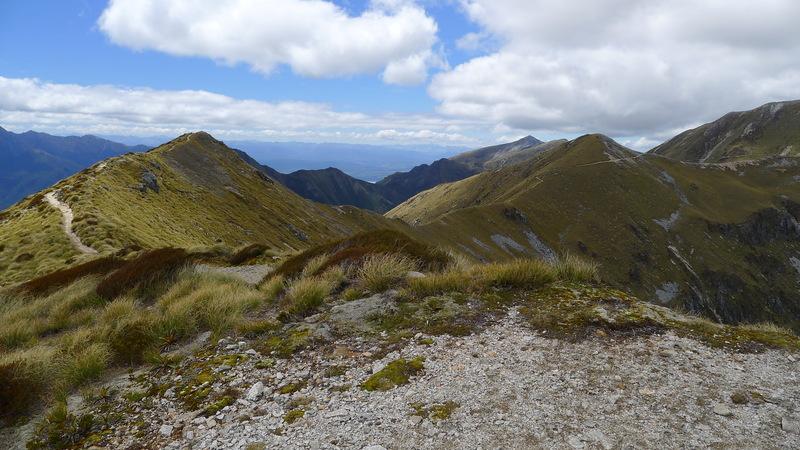 Our plan was to drive to Queenstown Saturday afternoon and start our 4 day Kepler Track hike on SUNDAY. When I was printing out our week of confirmation emails, I had a major freak out when the Kepler Track booking said “thanks for scheduling your track journey, starting MONDAY.” It turns out the booking we made several months ago was for Monday instead of Sunday…oops. Well our Christmas house rental started on Wednesday (Christmas Eve) so we HAD to end our hike by Wednesday. After confirming from the Dept. 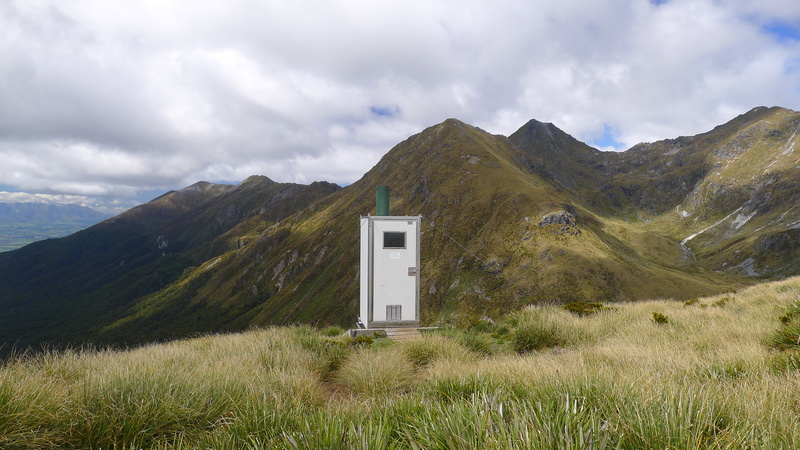 of Conservation (DOC) there was NO WAY we could change our booking (the Great Walk huts book up MONTHS in advance especially during Christmas time), we decided we would hike almost all of the track in 3 days instead of 4 and skip the last night in the hut. 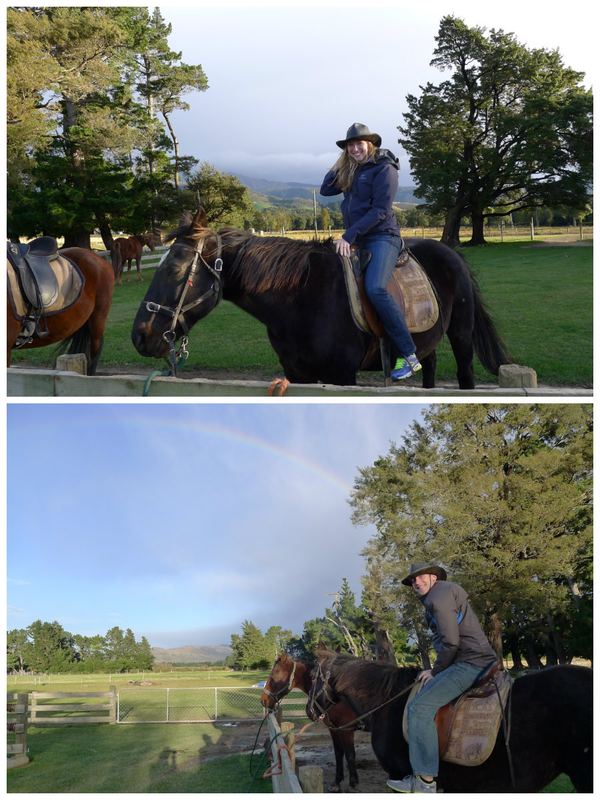 Looking back, this honestly made our holiday even better — 1) we had a full day to just relax in Queenstown and leisurely drive to Te Anau (the jumping off town for Fiordland national park where the Kepler Track is) 2) the weather was more perfect a day later and 3) we were super tired by that third day and ready to relax. 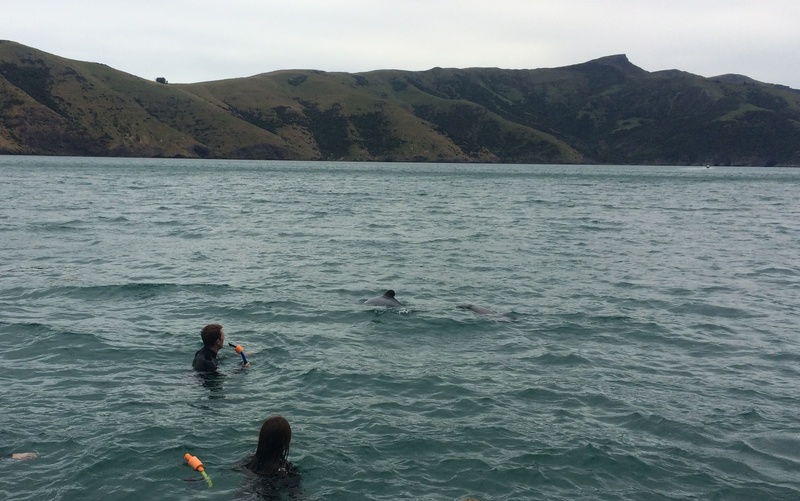 Ok let’s back up and start from Saturday—we actually went swimming with dolphins! Pretty random, but I saw a GrabOne deal (New Zealand’s version of Groupon) a few months back and thought it looked like a cool experience. I think this is probably one of the few places in the world you can swim in the wild with dolphins, or at least with the rarest dolphin in the world. 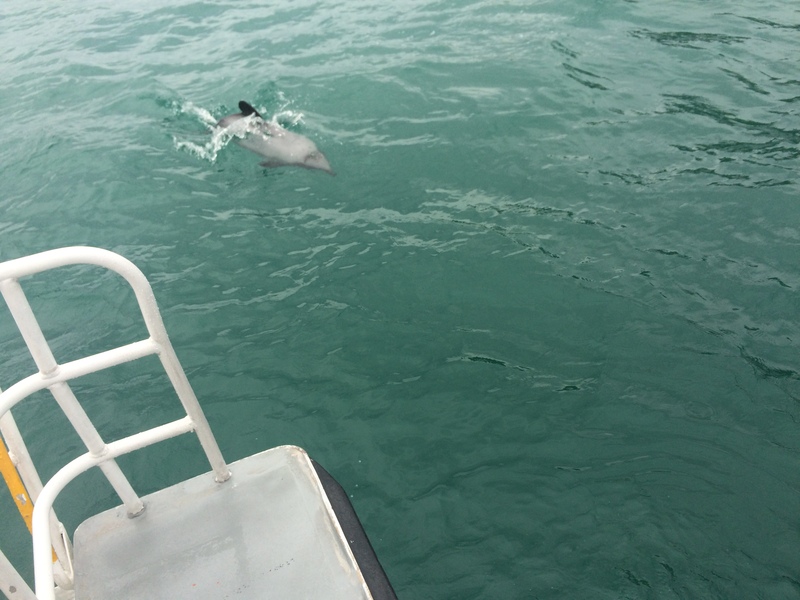 The dolphins in Akaroa are also the smallest dolphins in the world (the Hector Dolphin). 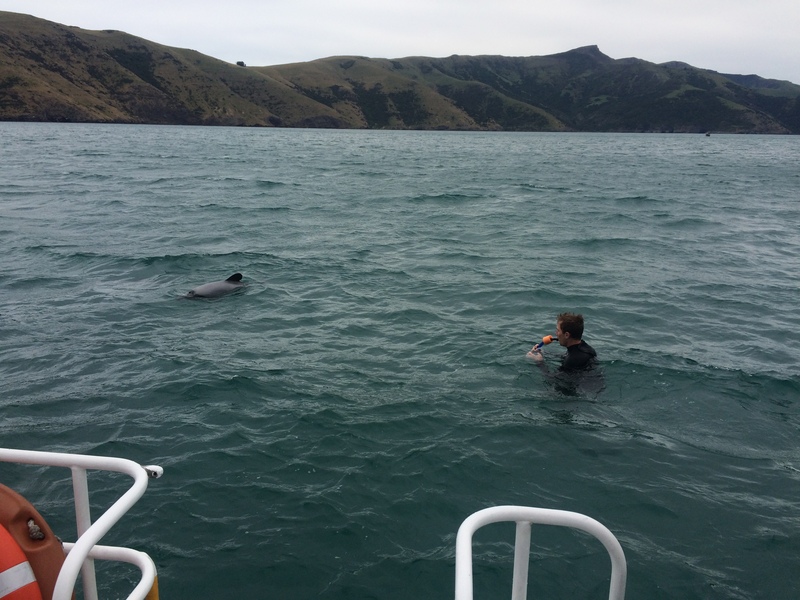 Apparently the dolphins are typically even more friendly, so Akaroa’s Black Cat Cruises gave us all some money back (even though we already got a discount to begin with)! I was impressed with their honesty – I’d recommend them! 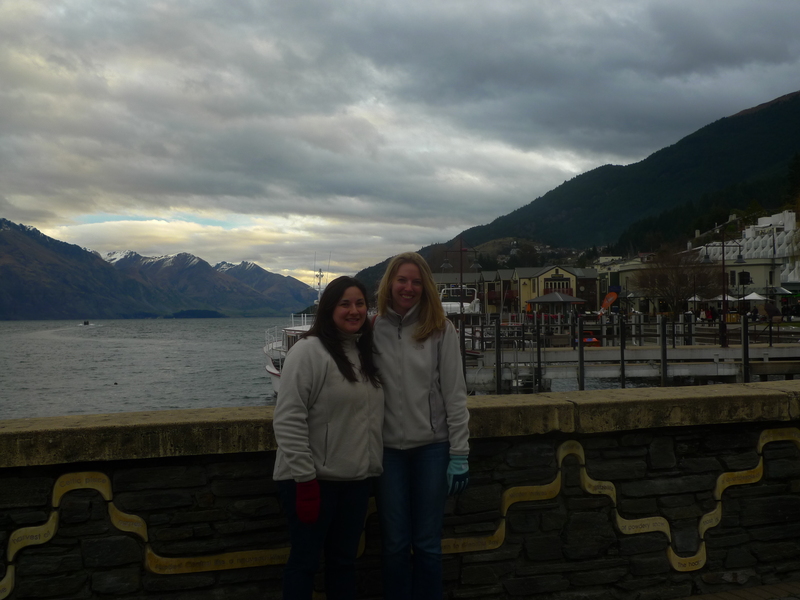 Then we drove the leisurely 6 hour drive to Queenstown, enjoyed the night and day there, and then headed to Te Anau to spend the night. 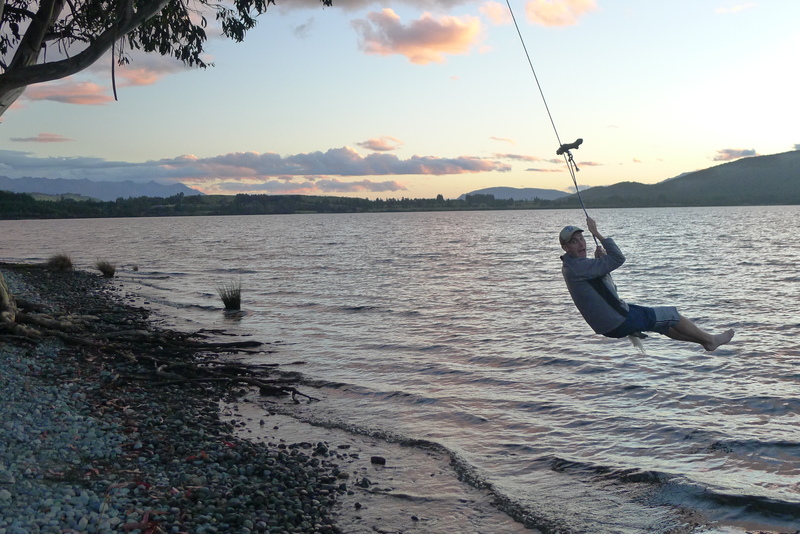 Te Anau is a nice quiet town that caters to all the tourists visiting Milford Sound etc. 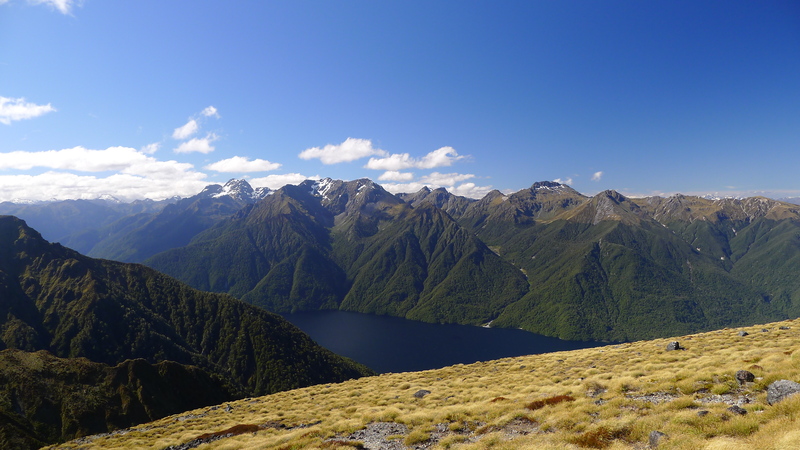 When we got to Luxmore Hut it was another 1.5 hrs to Mt Luxmore’s summit. 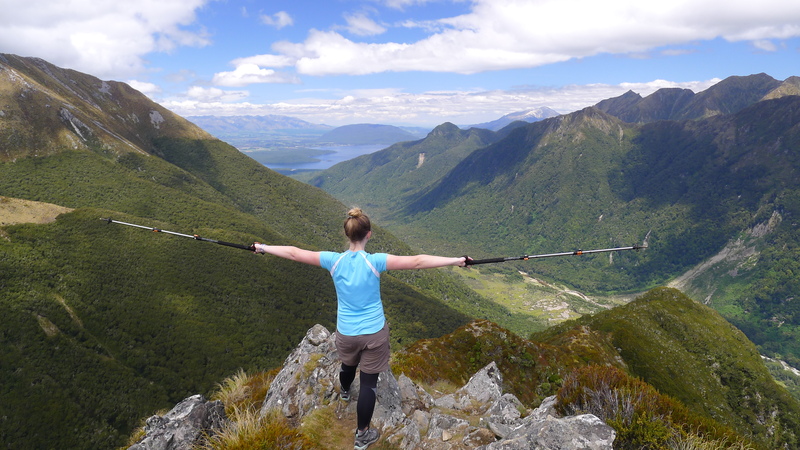 If it’s one thing you should know about hiking in New Zealand, when the weather is good – TAKE ADVANTAGE. We knew it could easily be miserable the next day, so we sucked it up and hiked even farther up. 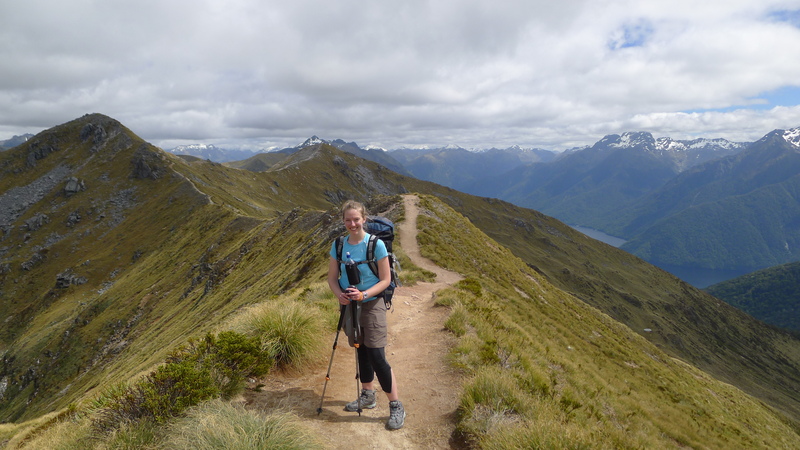 The second day of the Kepler Track was the most challenging day of I’ve done of the Greak Walks thus far–lots of up and down, up and down, crossing a ridge line for a bit and then a whole lot of down. The views made it all worth it! 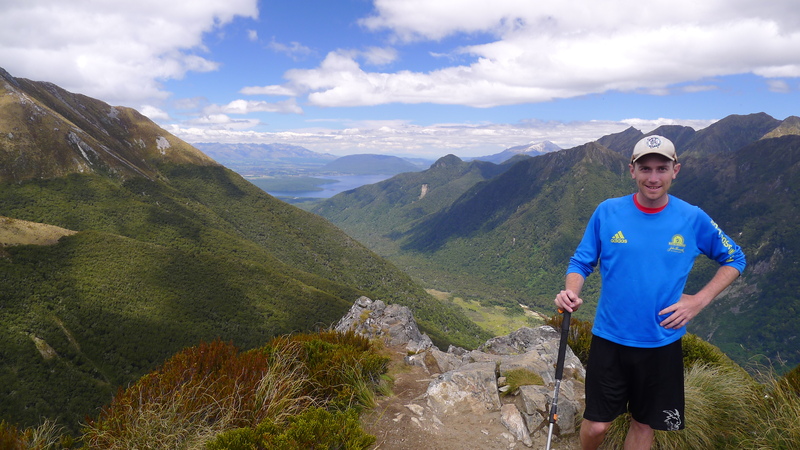 Warning…stepping on the soap box now…I’ve checked off all the Great Walks in Fiordland (3 of them–Milford, Routeburn, Kepler). It’s quite bittersweet. I’ve thought a lot about this over the past week and I can’t pick a favorite. They each have very unique qualities, and I had very different personal experiences hiking each of them that make them all amazing. MILFORD (post here) is super popular. Some people don’t do it because of the popularity…however, you have to figure, they only book 50 people/night in a hut, and that spreads out throughout the day of hiking. 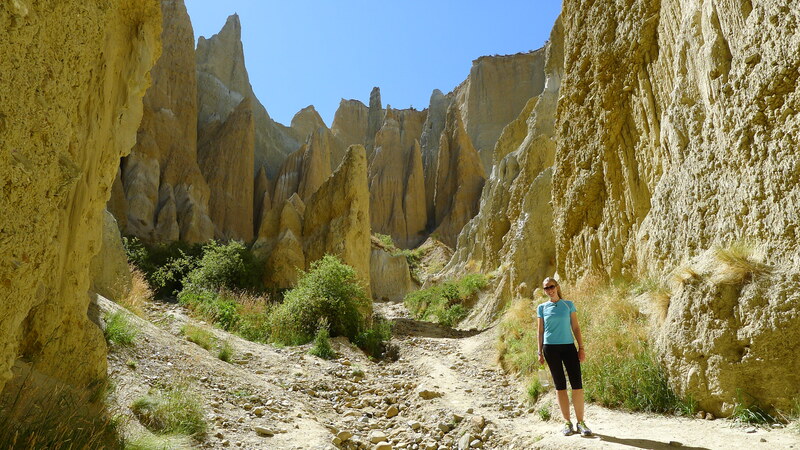 I am always so amazed about the lack of people we run into on these trails even if it is the height of tourist season. It is a heck of a lot of work to get to it…taking a shuttle, taking a boat, walking, taking a boat, taking another shuttle. However, that just means you’re walking through one of the most remote places there is. 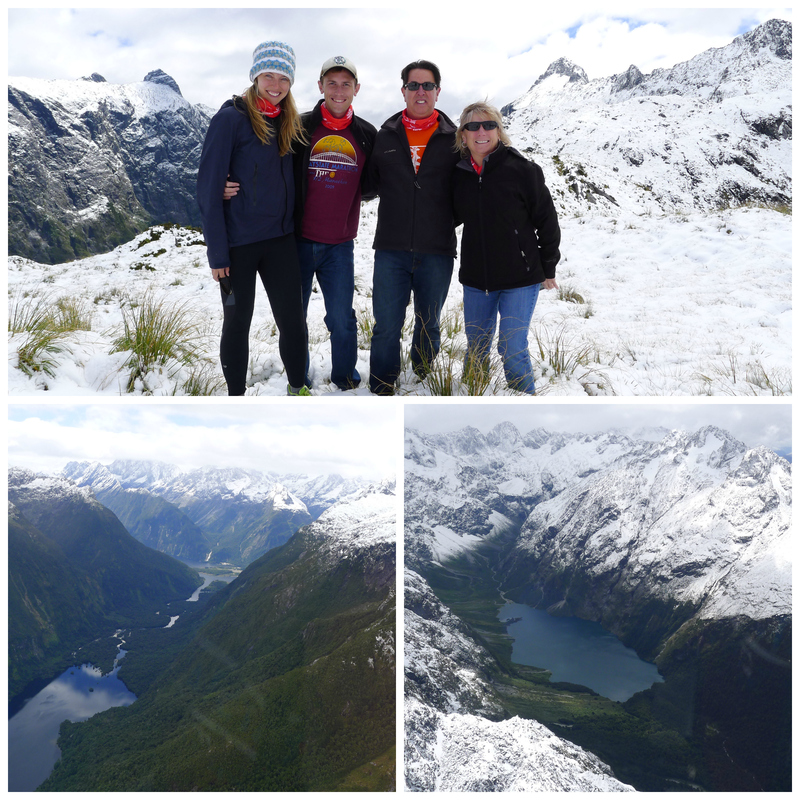 The valley views are incredible, topped with the drive back on Milford Sound road. It was a lot of fun hiking with my big group of coworkers in the off-season. I don’t think I’ve ever been so worried in my life with all the avalanches coming down the night before we crossed the McKinnon pass, but it ended up being quite the epic experience. 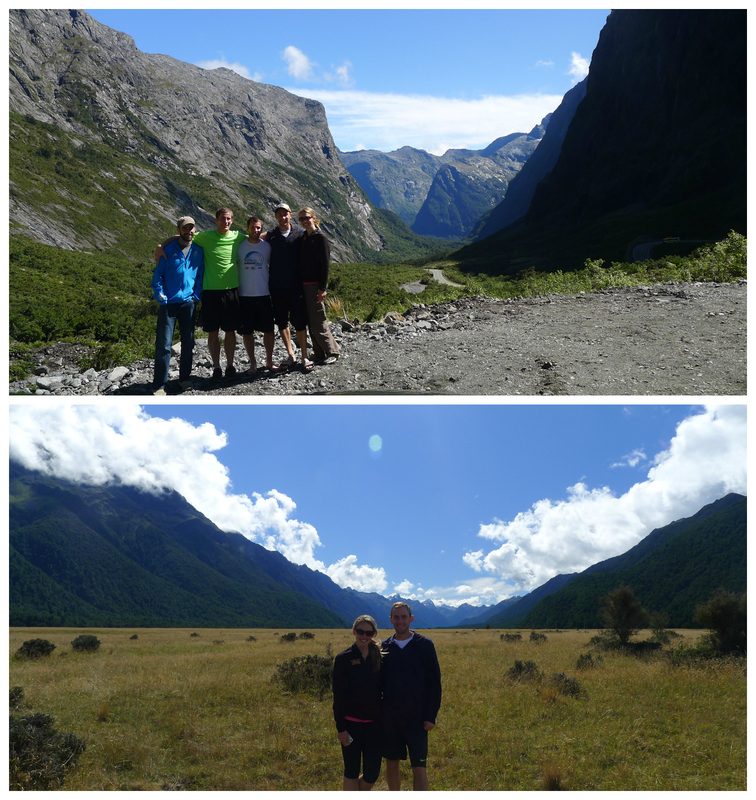 Milford = a big valley with huge mountains & waterfalls. 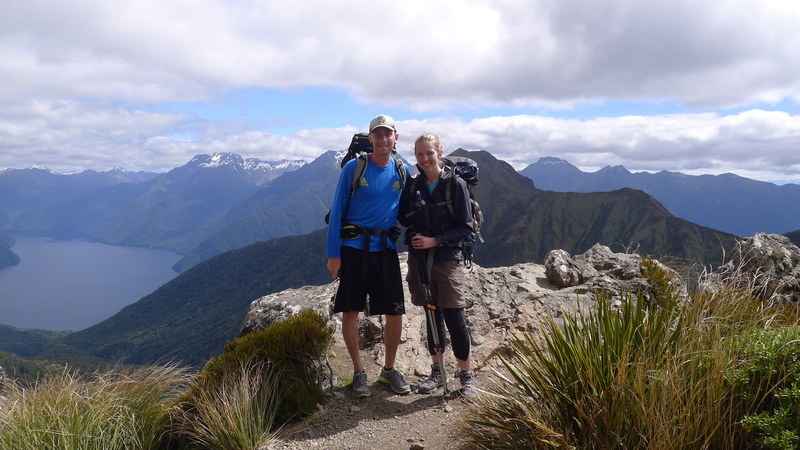 ROUTEBURN (post here) I think is the easiest to do in terms of time–it’s the shortest distance–however is a bit of a pain to transfer your car or figure out the bus schedule. Going down over that pass is another beautiful view. I honestly have no idea what this hike looks like from the highest point due to the blizzard I walked through while doing it. Luckily I wasn’t quite as worried as Milford, but still made for an awesome story and experience. 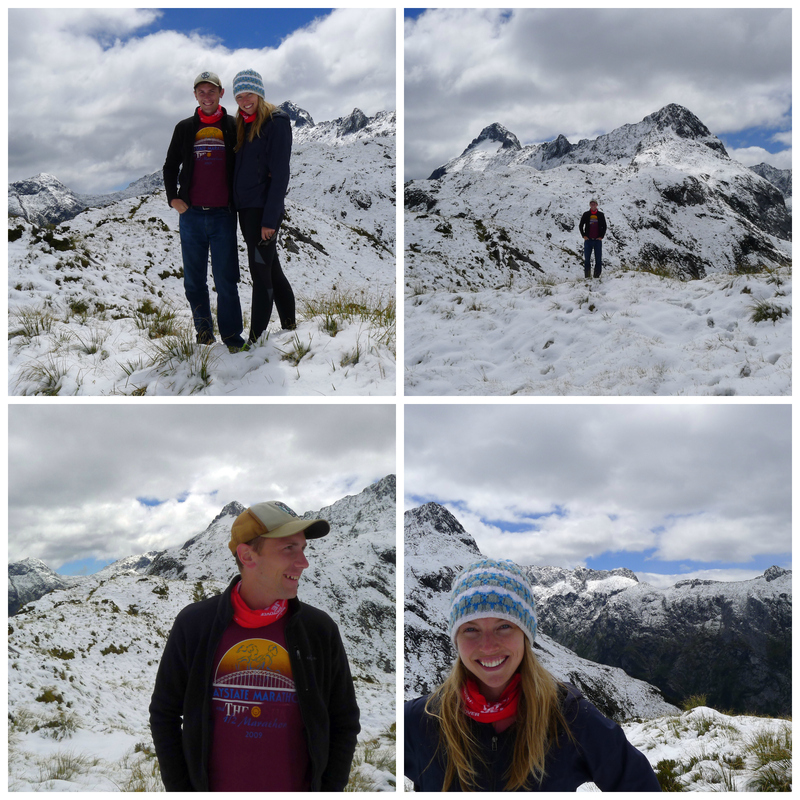 Routeburn = a mix of terrain with a beautiful view on each end. 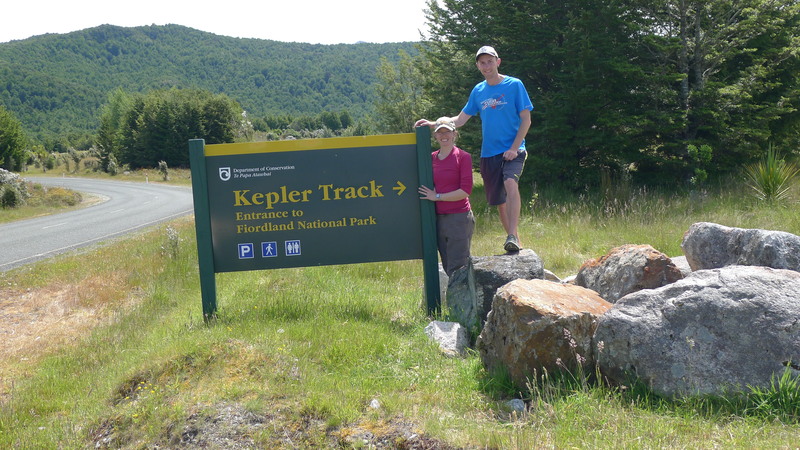 KEPLER is the most accessible being a loop track–no car transfer, boat, or bus required. Kepler, in my opinion, is the most physically challenging. I was so glad the weather was perfect (FINALLY!) for this hike, especially since we were on the mountain ridge for most of the second day. I could see this hike being far less enjoyable in dodgy weather. It was also nice hiking with just the two of us for once. Kepler = most accessible, with epic ridgeline views. Alright, that’s my schpeel! Another blog post to come (probably within the next day) on the next adventures we had shortly after Kepler! The Queens actual birthday is in April, but we celebrate it in June. 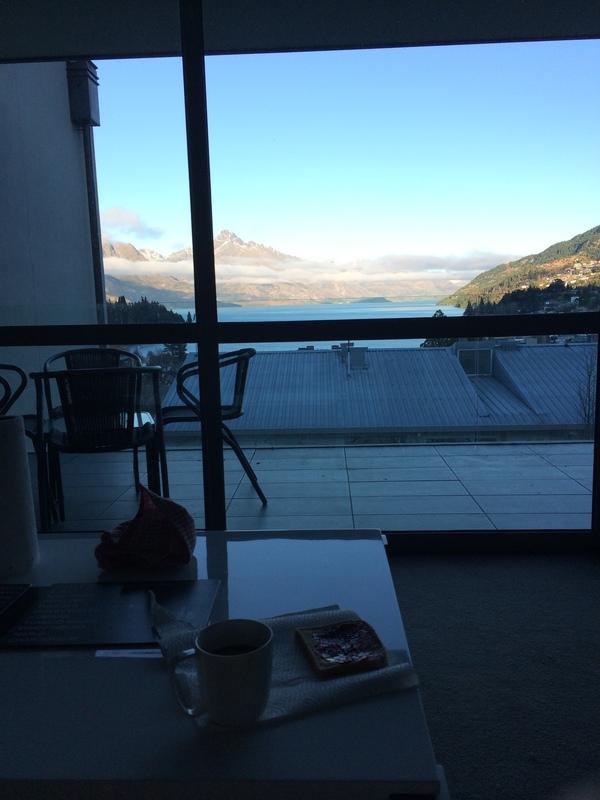 Probably a good thing since there are already so many holidays in April–ANZAC day, 2 days for Easter… Anyways, we decided to fully utilize the 3-day weekend, wake up at 5am along with 6 coworkers on Saturday morning, hop in 2 cars, and make the 6-hr scenic drive to sunny Queenstown until Monday. Although the drive is long the views are beautiful. 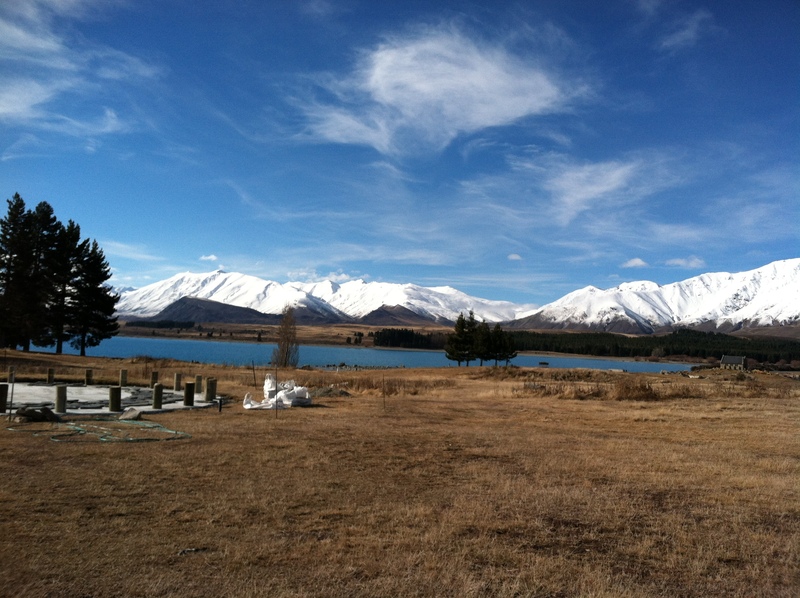 We did our typical pit stop at Lake Tekapo to stretch our legs, get coffee, and I even got to talk with my brother on the phone for a bit! Coffee with a quiet a view! On Sunday we split up to do a couple of adventures. 5 of us, including myself, went on a bike tour around the bike trails of QT. 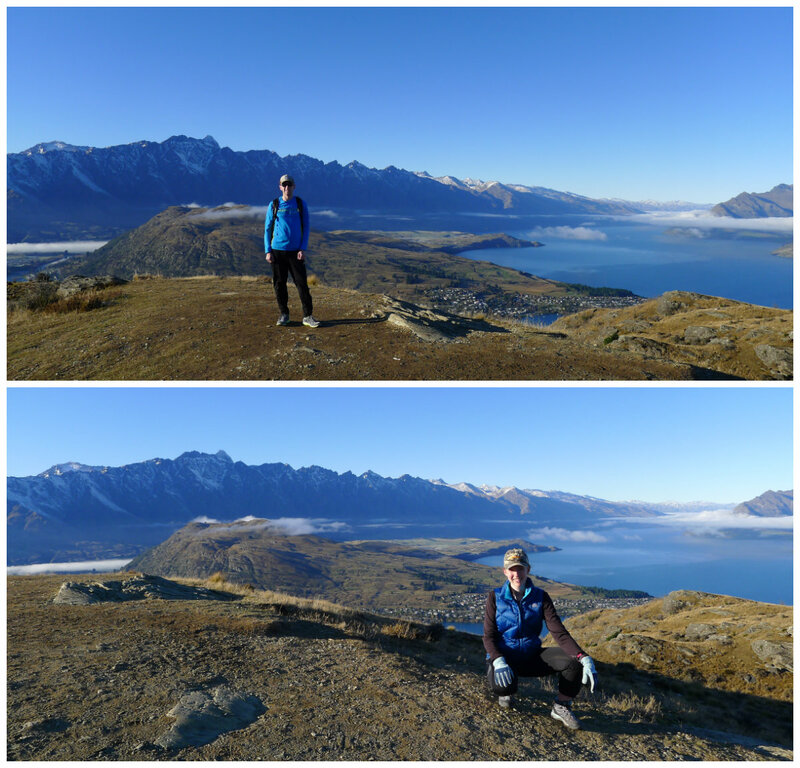 The other 3 did a horse trek up in Glenorchy. I will have to come back and do the horse trek too because it sounded amazing! Our bike ride was a lot of fun, yet FAR dirtier than I imagined. It ended with a wine tasting and we may have dragged some mud into the tasting room when we arrived. 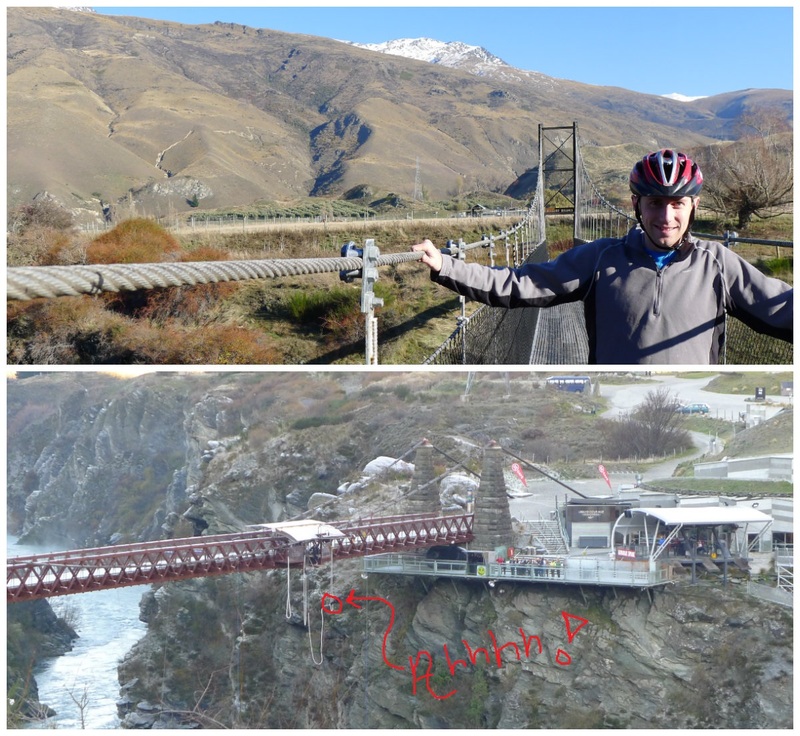 Overall we biked about 20 km and ended at the famous NZ bungee jump. We saw many beautiful rainbows upon departure! Disappointed with no longer having an activity for the day, Keith, my coworker, & I decided to create an impromptu wine tour. Because it was, then, 9:30am, we may have had to wait awkwardly outside at least one cellar door for them to open… We managed to visit Melton Estate (best winery + restaraunt), Trisillian (one of my favs! ), Straight 8 Estate (randomly found inbetween wineries, glad we did! ), and Lone Goat (winner of best logo and web page) before getting back to Christchurch for another flat-warming party. And finally, yes, this post is late (not that any of you noticed). I try to get them out by Wednesday latest US time, but this week has been the busiest yet. With a flurry of activity on one of our projects I’ve been out in the field every day this week marking up full-scale samples for testing. I grabbed our supplies Monday morning and then halted for a few seconds…realizing that if someone just happened to look in my box they wouldn’t be able to tell if I was a kindergarten teacher or an engineer. 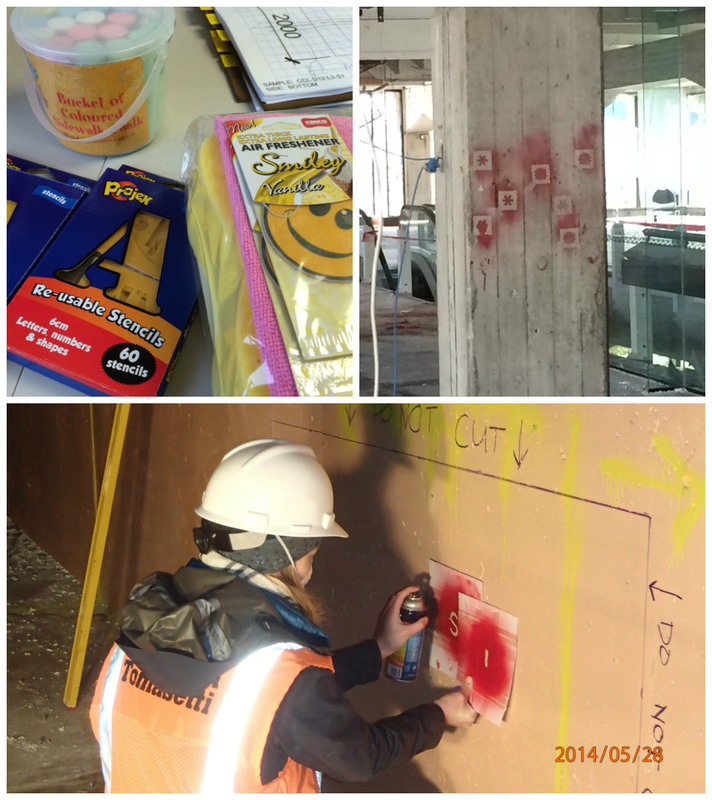 Likely “engineer” would be far from anyone’s mind with a bucket of sidewalk chalk, smiley face air fresheners, and some extensive stencils (including star, moon and heart shapes). Similar to any good CSI unit we had to go out to site, mark out our samples, carefully document any issues, and label every section. By now, I think I can say, I am quite the expert spray painter…as long as there’s a stencil involved. Now off to Queenstown for the Queen’s Birthday! 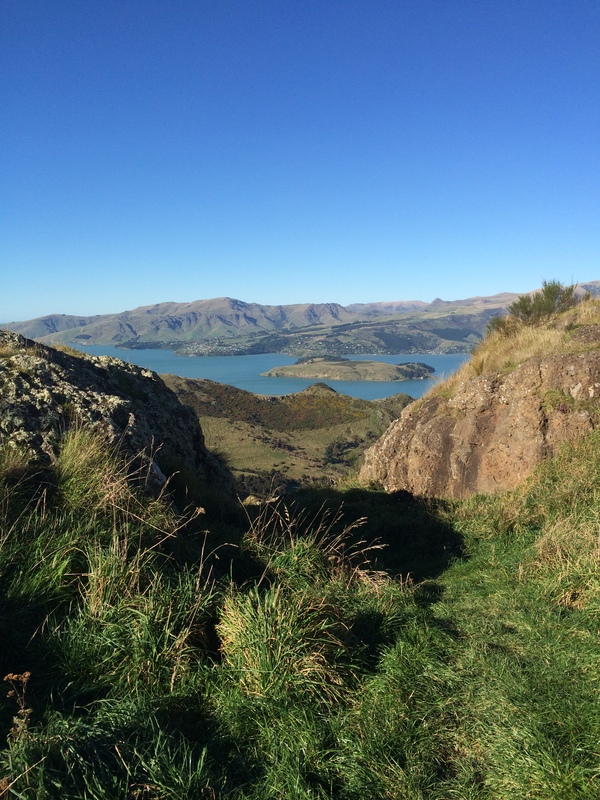 I am back in New Zealand after a brief “vacation” back in the DC office. I was able to enjoy seeing my colleagues, family and friends and soak up three precious weeks of summer–I will forever remember 2012 as the coldest year of my life! 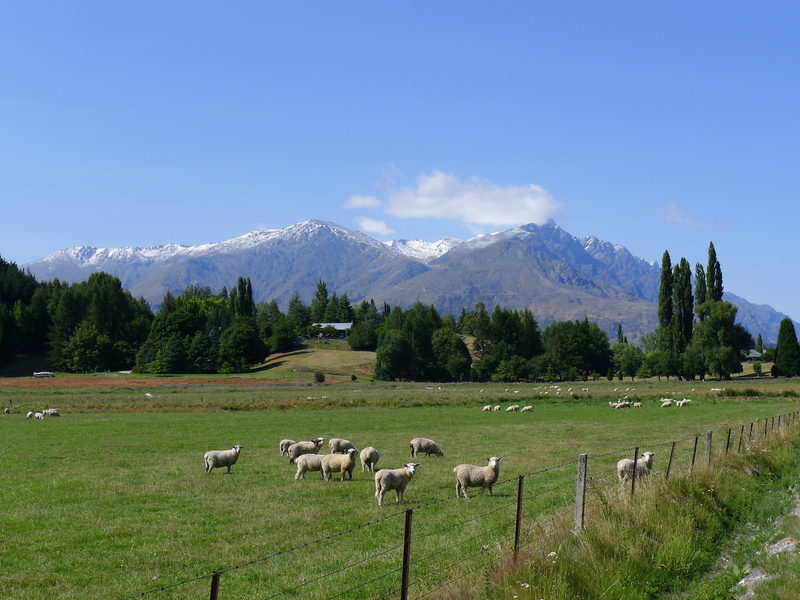 I was told that the second time around (coming back to New Zealand) isn’t as pleasant as the initial visit. I didn’t really believe that until I said goodbye to all my friends, family, & husband for the second time and sat down on the 1st of 3 long plane flights. It makes sense that there was this lurking, gloomy feeling while going back to a place 10,000 miles away that is no longer new & exciting. 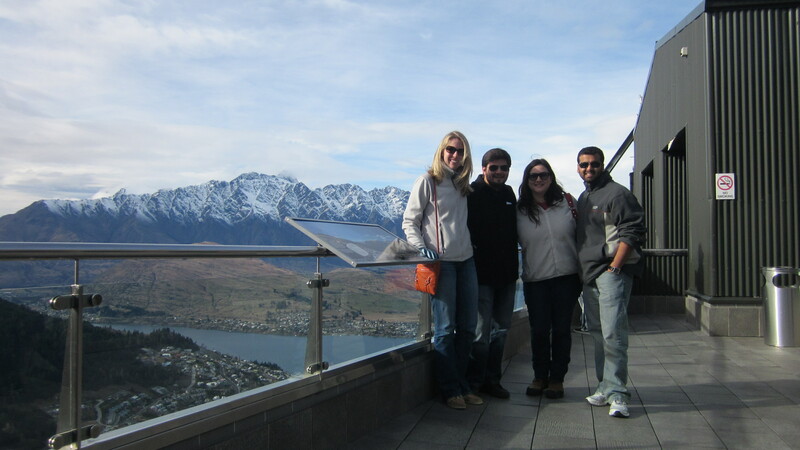 Luckily, once I picked up my left-sided rental car, settled into the hotel, showered, and drove back to the office, I realized how nice it was to be back with my New Zealand colleagues and finish up the work that I started here. It also isn’t too bad starting off my countdown to a Hawaii vacation after my New Zealand escapades are over (86 days & counting). 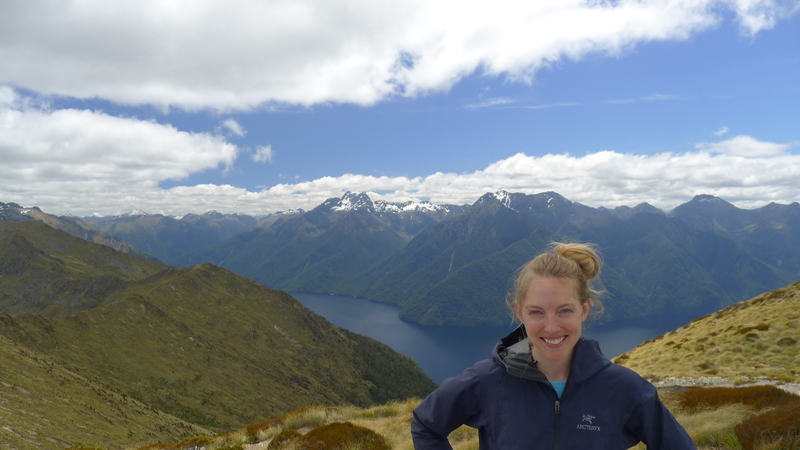 After a week in the office filled with scheduling new project site visits, finishing up some reports, starting some reports, and a bit of field work I was able to start crossing off my New Zealand bucket list. I have three (short) months left, which realistically doesn’t give me a lot of weekends to see all there is to see in Australasia. 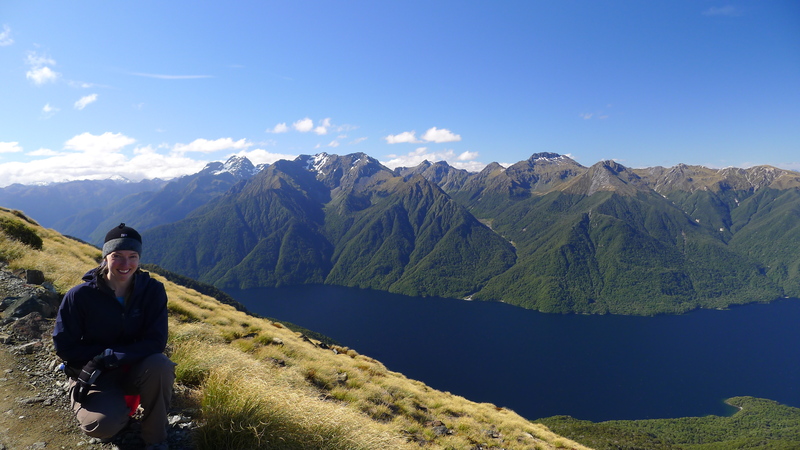 Somehow I managed to schedule a trip to Queenstown, book a flight to Sydney, start looking into plans for our corporate relay race in the north island, & start thinking about the Milford Trek within my first week back on NZ soil. 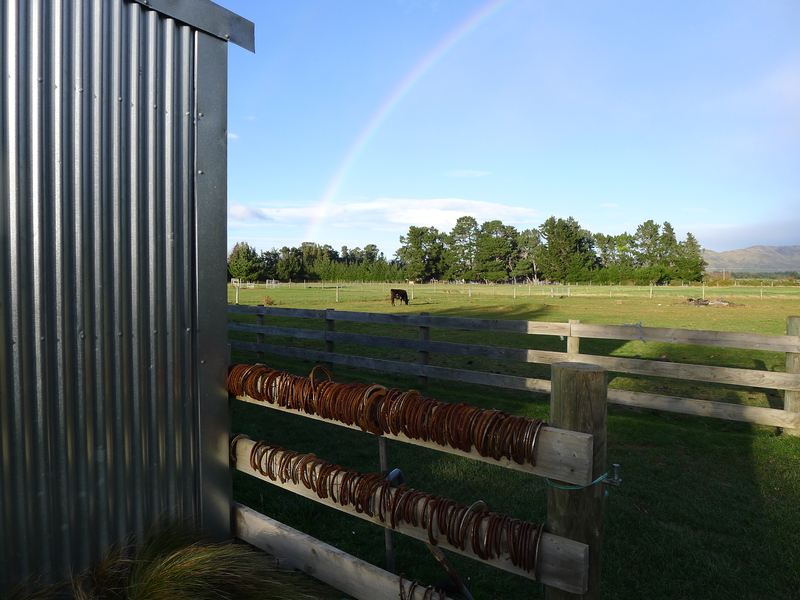 That still leaves space for scheduling a trip to Pancake Rocks, wine trail in Blenheim, a trip back to Auckland & more. We’ll see how this all works out while still managing to work overtime every week! Lets get to the past weekend. My original plan was to crash & catch up on sleep. 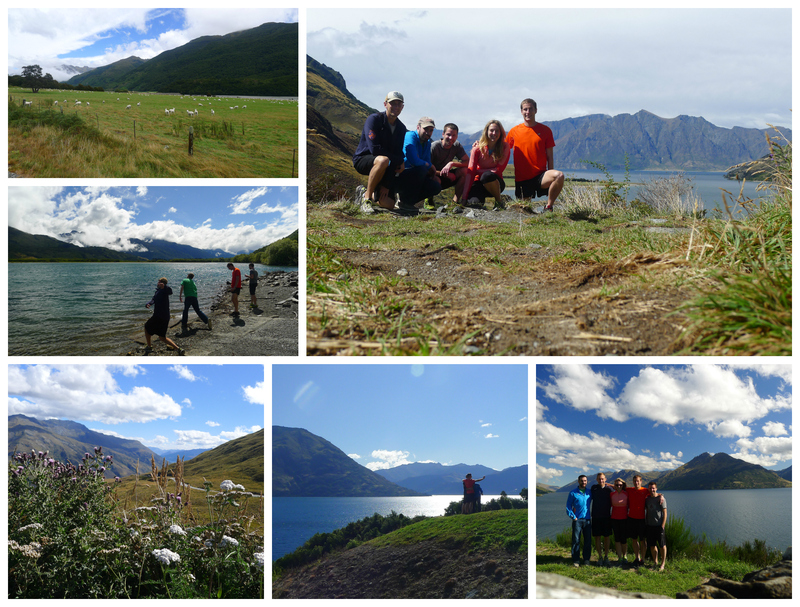 Instead I ended up helping organize another Friday dinner & a movie night (Chariots of Fire – we’re keeping everything Olympic themed lately), and decided to hop in the car with three other coworkers Saturday morning and drive to Queenstown for the night. 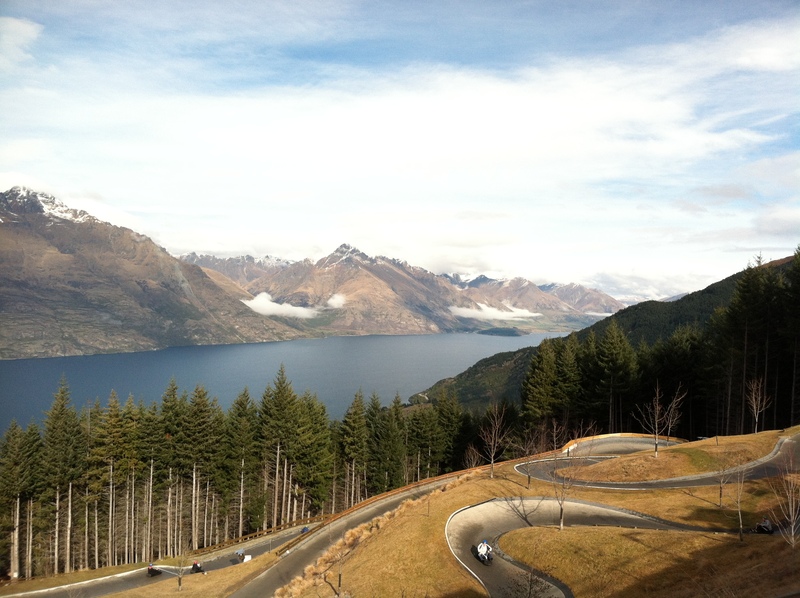 Queenstown is a 5-6 hour from Christchurch. 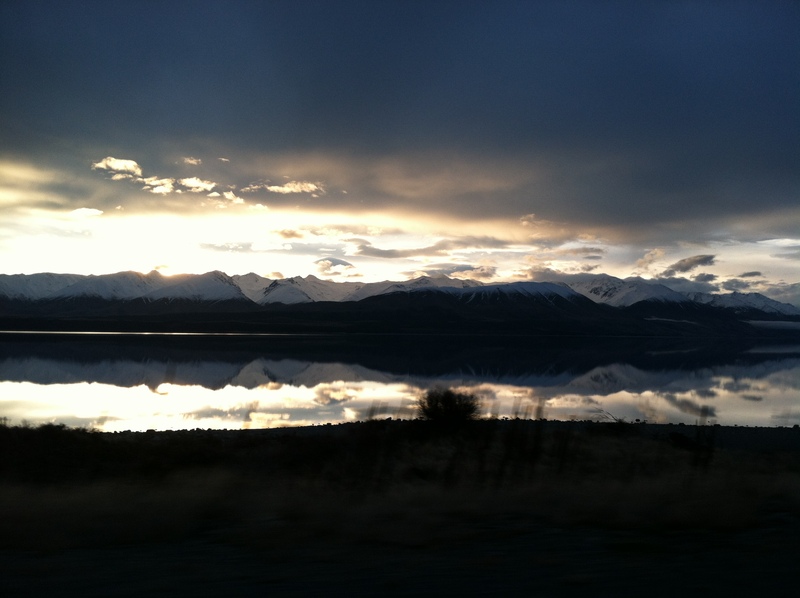 Therefore, it is not the quickest trip in the world; however, we made it work and even managed a pit stop at Lake Tekapo along the way. iPhone photo in a 100km/hr moving car. Impossible to take a bad photo during the car ride back to Christchurch. 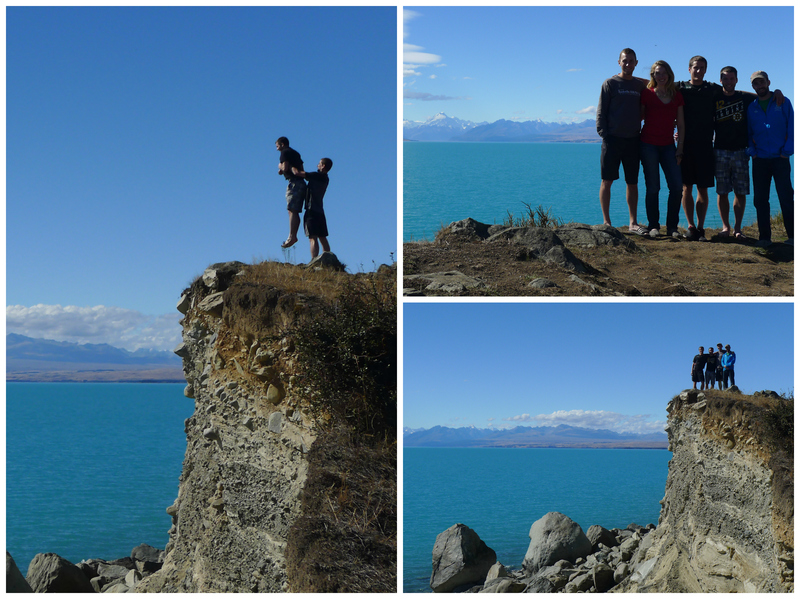 Made for a very quick, yet perfect weekend back in the Southern Hemisphere. Now time for some sleep to get ready for the work week ahead. Cheers!